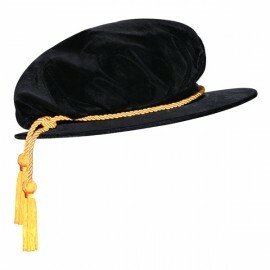 Complete your academic doctoral regalia for your graduation ceremony with our elegant brimmed traditional doctoral Beefeater cap. Using high standard material and construction make this a durable high quality black velvet top beefeater cap. Our black distinguished beefeater features a snug comfortable head rim and comes complete with bright gold bullion colored tassel. At Gradshop we offer a full range of doctoral gowns, sold individually or in doctoral tam and gown packages, academic Doctoral hoods customized to your requirements and Tams. Enjoy the simplicity of ordering great quality products at low prices when you shop online at Gradshop for a memorable ceremony.